Los Angeles, California-based Forever 21 plans to open a new "F21 RED" store later this year in Fayette Pavilion in Fayetteville. The new 20,000 square foot store will open between T.J. Maxx and Bed Bath & Beyond, occupying about half of what was previously The Sports Authority. Described as being "even cheaper than Forever 21," an F21 RED store essentially only sells "basic" Forever 21 merchandise, already cheap. For instance, items you can expect to find in an F21 store include camisoles from $1.80, jeans from $7.80, tees from $3.80, and leggings from $5.80. All of these items are currently found for similar, if not identical prices, within full line Forever 21 stores. Basically the F21 RED stores are just that: "basic" and only basic, carrying only the super cheap wares from the popular fast fashion brand. The first F21 Red store opened last year in South Gate, California near downtown Los Angeles. Additional locations has since been added around the county including one that opened this past May in Peachtree Mall in Columbus. 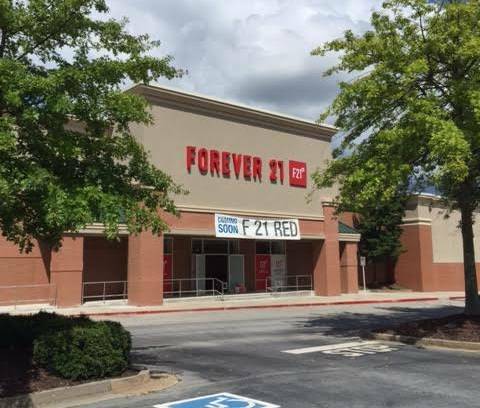 Forever 21 already operates a nearly 26,000 square foot store at Arbor Place Mall in nearby Douglasville. In related news, Forever 21 is rethinking its large scale mega stores, one of which is 162,000 square feet. The average Forever 21 is 38,000 square feet. Forever 21 is reportedly talking with landlords about downsizing some of its larger stores. Industry sources suggest the chain may try to reduce the size of their leases and or convert some existing stores to the F21 RED brand. Are you a Forever 21 fan? Have you been to an F21 RED store? Is Forever 21 too expensive for you?